Amongst the scholars whose writings reflect this emphasis on social etiquette and manners was Imām Muḥammad Mawlūd (d. 1905), the renowned 19th century Mauritanian reviver of the faith. Other than his Maṭharat al-Qulūb (Purification of the Heart) made famous in the English-speaking world by Shaykh Hamza Yusuf’s translation and lectures, Imam Mawlūd authored a long list of texts on ādāb, including the Maḥārim al-Lisān (Prohibitions of the Tongue), a text on the adab of hosting guests, one on the adab of seeking knowledge, one on eating, and another on the adab of the masjid. Allah graced our dear friend and noble scholar, Shaykh Rami Nsour, with the opportunity to devote a great amount of time and energy to the instruction of some of these texts and more recently their translation and publication. Several years ago, I was fortunate enough to be able to host and partially attend a lecture by Shaykh Rami on Imam Mawlūd’s poetic treatise on the rights of parents and filial piety, entitled Al-Ẓafar biʾl-Murād fiʾl-Birr biʾl-Ābā waʾl-Ajdād. Though I was only able to catch the end of his lectures, I was awed by the spiritual depth of not only the poem but the translator’s commentary and explanation. Later, Shaykh Rami informed me of his intention to publish his translation of the poem along with a brief commentary extracted from several sources. Since then, I have been eagerly awaiting its publication. A few days ago, I returned from a brief trip to Pakistan in which I visited family and teachers. Spiritually energized upon meeting some of the nation’s great scholars and spiritual masters, I was understandably having withdrawal symptoms upon my return home. 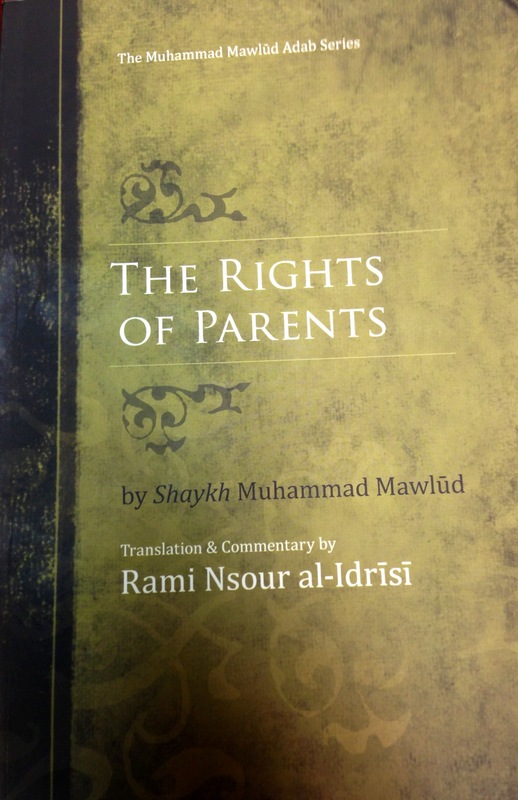 To my delight, however, I found two copies of Shaykh Rami’s recent translation The Rights of Parents sitting on my desk. Having read significant portions of the books since then, I am overjoyed to see that the translation reflects Shaykh Rami’s devotion to tradition and commitment to quality. The translation of the poem is fluid and does not attempt to imitate the poetic style of the original Arabic, a feat which is often attempted at the cost of easy comprehension. The commentary is concise and pleasantly draws from Arabic commentaries full of quotations, anecdotes, and lessons from classical sources. The commentary includes a variety of discussions, including linguistic analysis, exegesis, historical contentions, legal rulings, and of course, spiritual lessons. At the end of the book, Shaykh Rami has included the original Arabic text with translation as well as a section with just the Arabic text for easy memorization. As the first part in a series of translations that will comprise a larger, more comprehensive curriculum of Islamic texts for English speaking students, Shaykh Rami and Tayba Foundation (under whose name the book has been published) are deserving of a great amount of praise and support. It is hoped that the rest of the Muhammad Mawlūd Adab Series is as excellently published and made widely available for a large audience. As a first edition of the book, there are understandably a few typographical mistakes that found their way into the book which it is hoped are corrected in subsequent editions. The typesetting, binding, and paper selection is excellent. 136 pages, the book is concise enough to allow the average reader to benefit easily. Is this book available to purchase? I cannot seem to find it. It is not out for sale just yet. I will enquire as to its availability iA. I hope you are well. I had asked on your blog on where to require Birr al Walidayn, I wanted to just let you know that I ran into on maqboolclothing.com. Seeker’s Guidance is currently offering a course based on this book. Free. Well, not really, it requires serious students!